Little known fact: I was actually born on Thanksgiving, so naturally it is my favorite holiday! I love that it is the most selfless holiday, where everyone comes together around one table and remembers what they are thankful for. And since everyone is coming together around one table, it only makes sense that they have a lovely centerpiece to look at! Over the years I have tried tons of different centerpieces—fresh flowers, dessert spreads on cake stands, and one year I got extremely ambitious and made a cornucopia out of dough. But this year, being the first Thanksgiving I have a baby, I’ve realized my limits, and understand that my time is no longer my own. 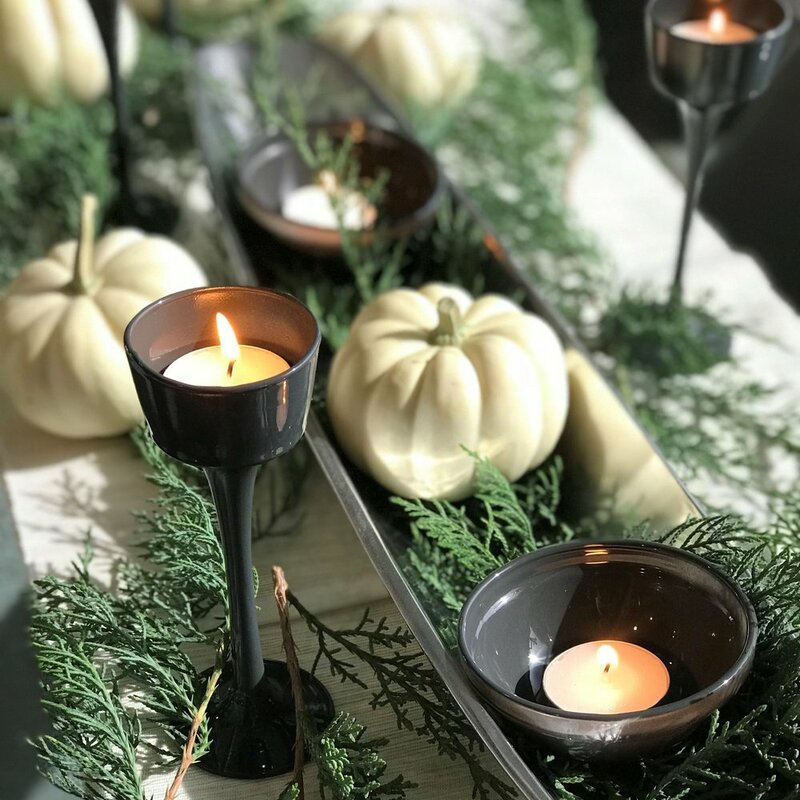 My goal was to find a cheap and quick way to jazz up my Thanksgiving table without breaking the bank or my back. I’m not sure if any of you are on the Dollar Tree train, but you should be! Literally everything is $1; I’m not sure what took me so long to realize the magic of that. I went to my local Dollar Tree in search of anything I could use as a candleholder. I ended up with seven tiered tea light holders, eight mise ramekins, and a 16-pack of tealight candles—all for $10! 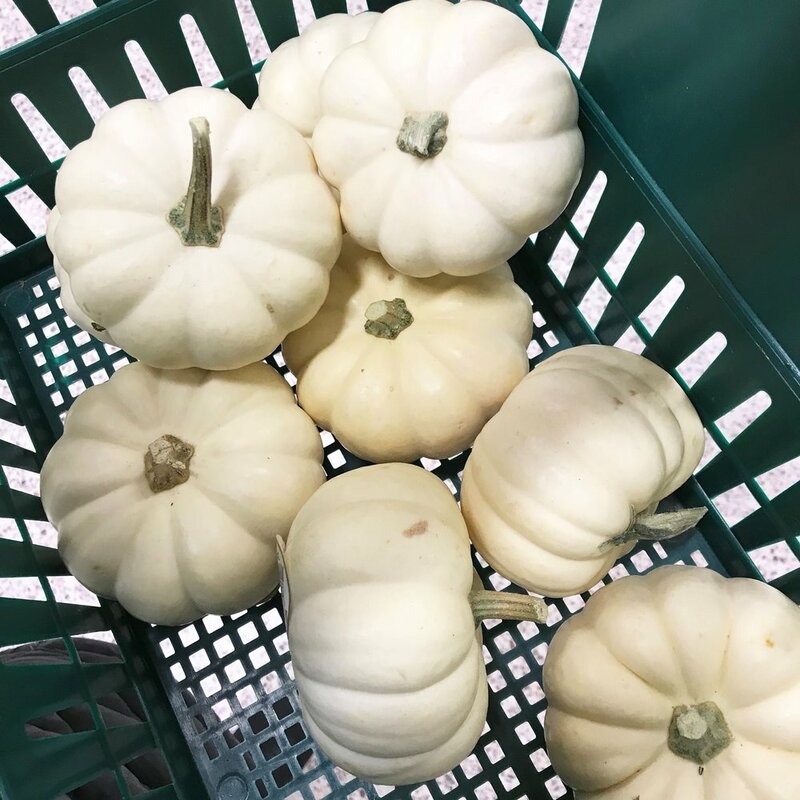 I then stopped by my neighborhood grocery store and picked out a few white pumpkins (for a total of $8.29). I collected some greenery from my yard, and used some gray spray paint I had from a past project to complete my design. Spray paint is one of those amazingly transformative things that can turn a cheap glass candleholder into an expensive-looking design element. One word of advice whenever using spray paint, however: wear disposable gloves. I have one too many times spray-painted something, only to have the tips of my fingers splattered with paint. So save yourself some hassle and scrubbing and pick up a pair of disposable gloves. I can’t wait to gather around my table this Thanksgiving with friends and family to enjoy my favorite holiday. And I’m so happy that this centerpiece took some of the stress off my plate.